For Jenn Wasner, the guitar is a tool that unlocks her creativity. Though she trained on classical piano pieces as a child, she didn't get into writing songs and making music until she picked up the guitar in her teens. Then, she was off to the races. After honing her craft for years, she started a band called Wye Oak and put out a string of critically-acclaimed records full of delightful folk-inflected songs full of nuggets of pretty noise, new wave electropop flourishes, and smears of shoegazey goodness (do yourself a favor and check out 2011's Civilian if you haven't, Wildwoodians). Jenn had already been playing Reverends for about ten years when Ken Haas approached her about doing a signature model. As luck would have it, Jenn needed a guitar that would match her stage outfit for her upcoming tour for her solo project, Flock of Dimes (also excellent). So, she enlisted her friend April Tamlin to design a sweet graphic, and Reverend made it happen! Though it wears a fancy coat of paint, the Jenn Wasner Signature is a working musician's instrument. Based on the Charger HB platform, the JW-1 has enormous resonance, supreme dependability, and versatile yet simple electronics. The magic starts with the korina body. Korina is a delightful tonewood with a similar sonic profile to mahogany (warm, punchy, even-tempered) but with a livelier top-end. It's an excellent building block for a killer electric guitar sound. Then, the roasted maple neck works its magic. When Reverend removes the moisture from a guitar's neck through the roasting process, it does two things: improve stability so that your setup stays consistent, and impart a bit of woody vintage flavor to the instrument's tone. Two of Reverends HA5 humbuckers do an admirable job of building upon the Jenn Wasner Signature's stellar unplugged voice. HA5s are pitch-perfect modern humbuckers: warm, midrange-forward, muscular, and full-sounding, but with excellent articulation and clarity. Should you desire more chime, quack, sparkle, and bite, you can simply roll off Reverend's famous bass contour knob and unlock a wonderful world of brighter tones. Of course, a seasoned road warrior like Jenn needed an instrument that would stand up to the rigors of gig after gig. So, Reverend pulled out all the stops to make the JW-1 as dependable as humanly possible. To that end, they equipped it with a Boneite nut and pin-lock tuners for maximum tuning stability. Then, they plopped in some high-quality boutique caps and pots to ensure consistent electronic response for each guitar. Also, they've included a treble bleed circuit to keep you from losing tone when you turn down. Even the hardware is souped-up! The neck plate is angled for maximum comfort and has six bolts instead of four to promote stability, sustain, and resonance. Reverend also uses PureTone jacks which have excellent audio quality and grip. We're getting into minutiae here, but the jack plate is also made of steel and has four screws instead of two, so it isn't going anywhere. It may seem ridiculous to go into that much detail about small parts, but it does illustrate how the Reverend team thought of every possible little improvement they could make in order to make the player's life easier. Because Reverend knocked it out of the park with their detail-oriented design, the Jenn Wasner Signature is a serious workhorse! 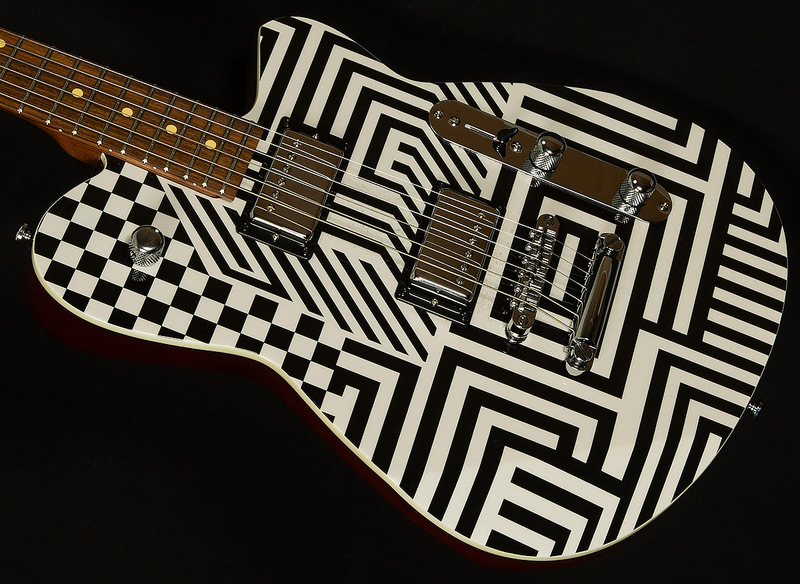 We're proud to showcase Jenn Wasner's Signature Reverend for our exceptional customers. Jenn is a supremely talented songwriter, singer, and multi-instrumentalist, and it is an honor to have her sweet signature model grace our shelves. Anyone looking for a workhorse with an eye-catching paint job will love the Jenn Wasner Signature!